You’ve gone through the first introductory routine successfully. You now have the habit of working our 3-4 times a week. The routine has become easier, the excercises have become a piece of cake. What should you do now? Whenever you feel like what you’re doing is too easy, to light, you need to step up your game. Make things more interesting by adding some reps, changing some excercises or making the step towards the next progression routine. You never want to stagnate because you make things too easy for yourself. Let’s take a look at the routine below. This is the second step out of the 6-7 step progression plan to muscle-up (an excercise that separates you from beginners). The only two things you need for this workout is a pull-up bar and a dip-bar in your local public park. If you can’t find these, make sure you turn on your creativity and look for some horizontal and parallel bars that might be good for substituting these two. Before you start, always warm up and after you finish, always stretch properly – an injury is the worst nightmare as it slows down (sometimes reverses) your progress, it negatively impacts your mentality and it is simply very, very annoying. You don’t want that! The warm up and stretching don’t need to be special in any way. A standart run around the block, some lighter upper body movements and quick 20 sec stretches should do the magic. The step from the first routine to this might be a bit big as it is your first increase in the difficulty of your workout, but that is exactly what you need. Push thorugh, don’t give up and make it happen! 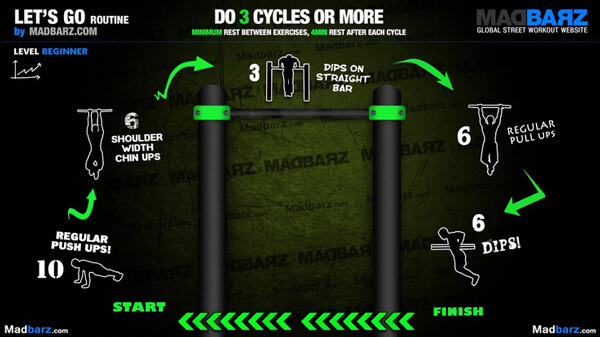 The information in this post comes from our many years of experience and uses the routine structure from Bar Brothers Groningen as I personally used their routines to get to my first muscle up.